Support a great cause and get a chance to win a gun! 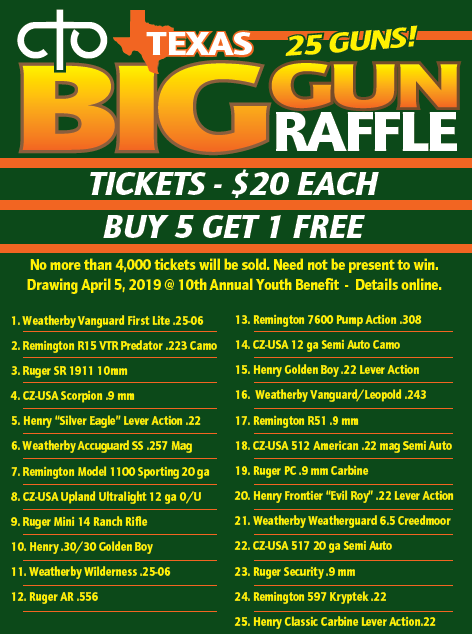 We will draw for the winners of these 25 guns on April 5, 2019, and you need not be present to win. Tickets are $20 each. Buy 5 and get 1 free. To get your tickets, contact your local CTO chapter outfitter or purchase here online. At the drawing, we will start with Gun #25 and work our way to Gun #1. You can win more than 1 gun if you have more than 1 ticket in the hopper. No more than 4,000 tickets will be sold, and you need not be present to win. Guns must be transferred through an FFL (Federal Firearms Licensed Dealer) within 15 business days notice of winning. The drawing will take place April 5, 2019 at our CTO Texas State Banquet. Winners not at the drawing will be notified by Saturday, April 6, 2019, and announced on the CTO Texas Website and Facebook page. Winner must be able to legally possess a firearm and pass required background check, otherwise entry is void. Proceeds benefit Cross Trail Outfitters of Texas, a 501c3 Nonprofit Public Charity.